Diaries serve as a space for people of all ages to record their thoughts and memories. Some may draw pictures in their diaries while others write poetry and stories or slip keepsakes between the pages. The only universal truth about diaries is that they are private. 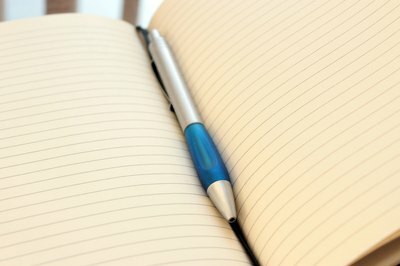 The only sure way to keep your diary private is to make one with a lock. Making your own diary also gives you the opportunity to personalize it to your tastes and personality. This project is very simple and makes an entertaining afternoon project. Measure the width and length of your journal’s front cover and the width of the spine. Double the number for the width of the cover and add the width of the spine to that number plus 1 inch. Add 1 inch to the length, also. 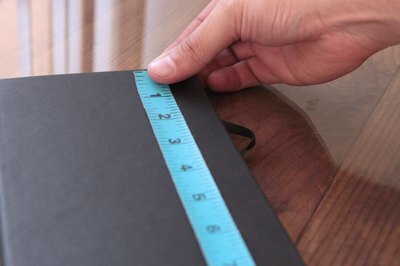 For instance, if your journal cover measures 6 inches wide and 8 inches long with a 1 /2-inch spine, your measurements are 13-1/2 inches and 9 inches. Draw a rectangle on the wrong side of the fabric using the measurements from Step 1. Cut out the rectangle and spray the wrong side of it with spray adhesive. Press the fabric against the spine of your journal first, then over the front and back covers. Snip a diagonal slit in the excess fabric at each corner of both front and back covers of the journal. Snip two additional slits on each side of the spine at the top and bottom. 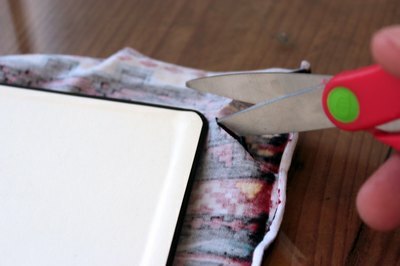 Open the front cover of your journal and fold the excess fabric over the edges of the front cover, securing them with more adhesive if necessary. Do the same with the back. Tuck the excess fabric at the top and bottom of the spine into the space behind the spine. Cut two pieces of patterned paper the length and width of each cover, minus about 1/2 inch from both dimensions. In this case, each paper would be 5-1/2 inches wide and 7-1/2 inches long. Glue these pieces of paper to each inside cover, concealing the raw edges of the fabric. Close the diary and lay it in front of you. Center the hasp lock hasp on the front cover about 1/8 inch away from the right edge. (A hasp is a U-shaped piece of metal that holds hasps closed with the help of a padlock.) Push a tack into each hole at the ends of the hasp. Place the end of your flexible measuring tape about 1/4 inch from the center edge of the back cover of your journal. Bring the tape around the front of your journal to the hasp. Note the measurement and cut a piece of fabric about 1/2 inch longer and about an inch wide. 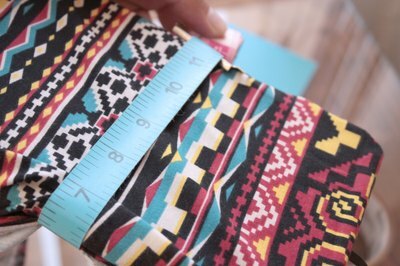 For instance, if your measurement is 2 inches, your fabric should be 2-1/2 inches long and 1 inch wide. Fold the fabric in half with the wrong side showing. Stitch the long open edge and one short edge together to make a tube. The folded edge doesn't need any stitching. Turn the tube inside out so you can see the right side of the fabric. Pry a link from your chain with a pair of pliers. 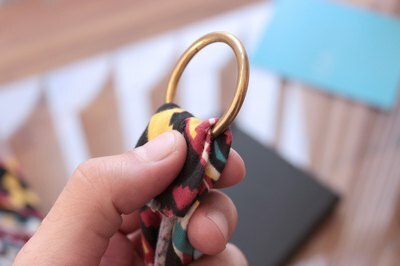 Squeeze it closed again so you have a closed individual link. Slip the link onto the raw end of the fabric tube, fold about 1/2 inch of the tube down around the link and sew it fast to hold the link in place. The raw edge will be hidden under the rest of the fabric tube. Place the other end of the fabric tube against the center back cover of the journal, about 1/4 inch from the edge. Push two brass tacks into the end of the tube to hold it in place. 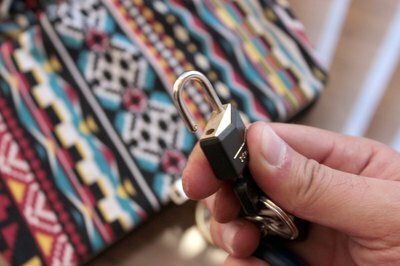 Bring the strip around to the front of the journal, slip the chain link over the hasp and slide a mini padlock through the hasp. Lock it to preserve your privacy.